It seems like ages now since we went to Rubix. Just a long brick pipe with a little junction at one end. It’s fed by the River Effra, long since buried under the streets of South London and turned into a sewer. Rubix itself is known as the South Western Storm Sewer, essentially there to collect the overflow from the sewer when it rains. We had something of a procession. 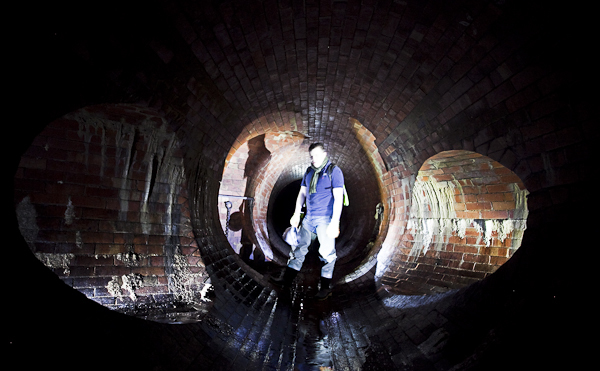 John joined us for his first sewer experience, and Brad, Neb and Chris also attended. 5 in a sewer can be a little heavy going and it was a slog taking photos. We had Red Stripe, shouted loudly as the echoes bounced back up the tunnel at us, and slid our way down towards the chamber where the Effra overflows into the dry brick pipe. 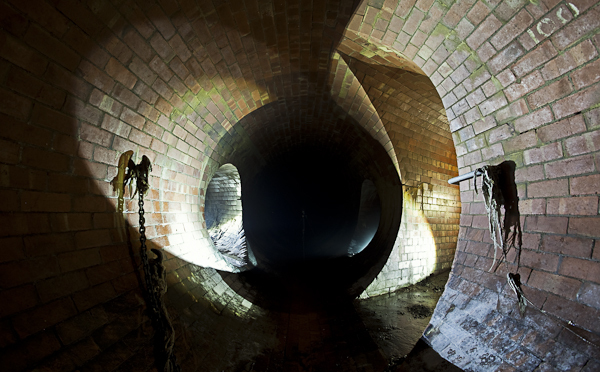 One wonders how long it might take a fill up – it’s the dilemma of sewers. They’re hardly hospitable places, certainly not designed for people to go, but again, nor are train tunnels but we delight in walking down those as well. I’m probably going to go back here and take some more photos. There’s more to it than what we’ve seen, and I usually end up walking a small section at a time. Most of my trips are mid-week evenings where 4 or 5 hours is the max, before getting back in the car and driving home ready for work again. I think the longest I’ve ever spent in the drain in one go would be the IDM or Siologen’s leaving do, and those are the social occasions. It’s a commitment thing really – some people can spend hours upon hours taking photos of drains, looking to complete every mile of every section in their area. With all the other delights of the city, I find it hard to concentrate on one thing. Drains seem to ebb and flow for me. I’ll go in a few in the space of a few weeks, but there seemed to be a big gap in drains between going to Last Bastion with Drainpipe and then Siologen’s do, probably 2 months? It’s bad Drainor form, but as long as we’re still having fun, that’s the important thing. Subscribe to comments with RSS or TrackBack to 'Rubix'. And what a lovely photograph that first is.